Considering the rough condition of my knee after Mt. Carrigain, we decided to take a trail with little elevation gain to see how it went. 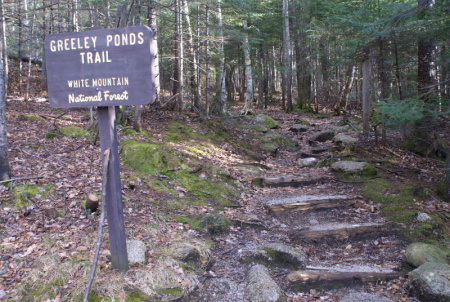 That was 2 mile hike to Upper and Lower Greeley Ponds from the northern end, trailhead off of the Kancamagus just before the hairpin. We made it up there a little later in the day than I wanted to, and we lost the sun behind East Osceola pretty quickly. The trail featured a number of muddy sections and stream crossings that I’d mostly forgotten, even though I’d done this trail back in September. I think the streams were a bit more serious, as there’s been plenty of rain around here lately. A lot of the trail featured wooden log bridges to help keep the trekker up out of the mud. My capable daughter navigated them admirably well, although I was anticipating a wipeout at any given time from either her or her younger brother. The boy knows no fear, and sometimes tromps on ahead with reckless abandon. One of these days, I’ll be pulling his surprised face from a stream he falls into. My knee was fine. I think I’ve figured out what happened to me up there on Carrigain. Apparently, there’s this band of tissue running down the outside of your leg called the iliotibial band. When inflamed, you’ve got iliotibial band syndrome (ITBS). While I can’t say this for certain, all the symptoms I had and the kind of activity I was doing match up with what I’ve read. Over at sectionhiker.com, I found an article talking about his experience with ITBS, and how a specific brace helped him out. I’m planning to get a brace, and wear it preventatively on my next big hike, where there’s a lot of vertical gain. I’m also going to make sure I don’t hit the StairMaster at the gym in the days before my hike. I think that was really what put me over the edge – StairMaster for 2 days, and then doing Mt. Carrigain was just too much to handle. The Greeley Ponds trail is a nice hike. I want to visit it again and take Mt. 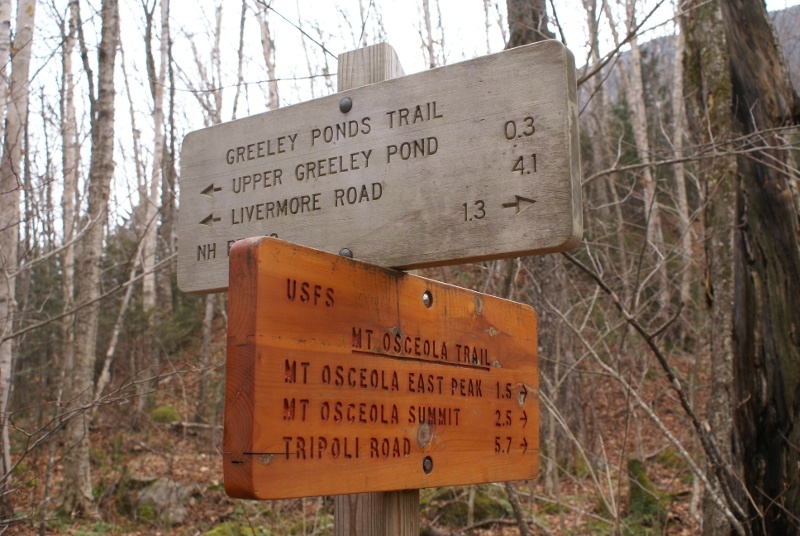 Osceola trail. That trail is supposed to be really steep and rough, especially the section in between East Osceola and Osceola. I do love a challenge. My lovely wife and son did get a bit ahead of us, and waited trailside at Lower Greeley for my daughter and I to catch up. We all stayed together on the way back, especially for the one big stream that required care to cross without getting wet feet.